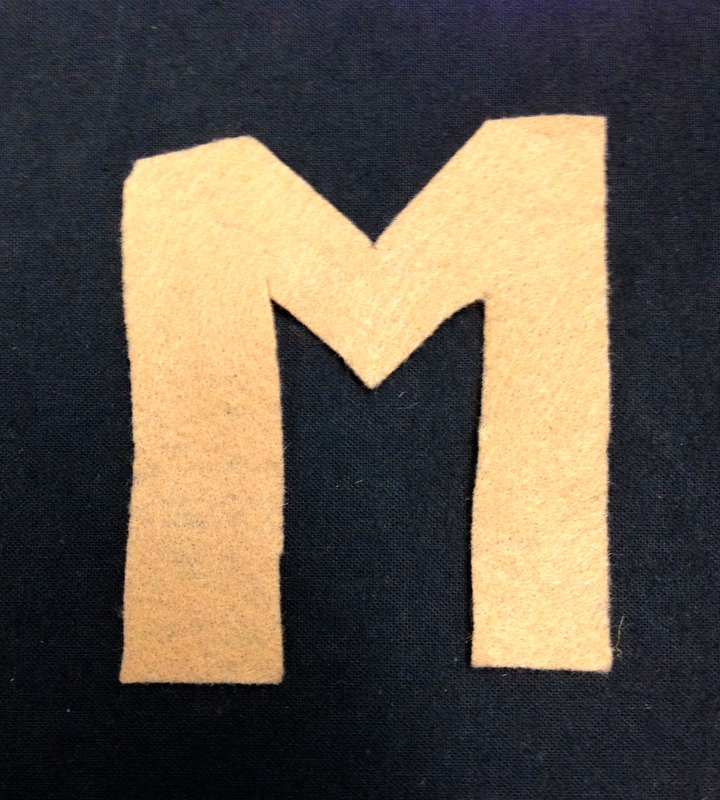 March storytimes are all about the letter M. This week I featured some great books about monkeys and brought out the paint for our art project. 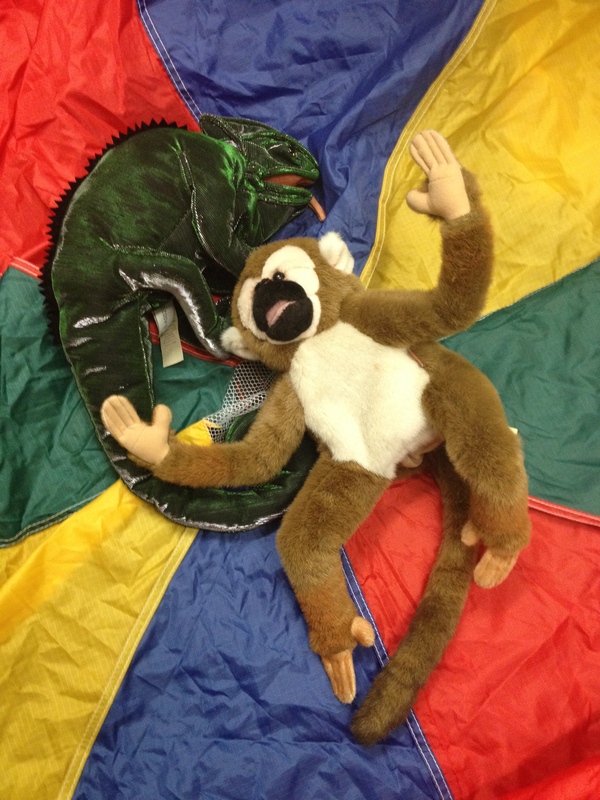 To introduced this week’s storytime theme, I brought along my monkey puppet friend. 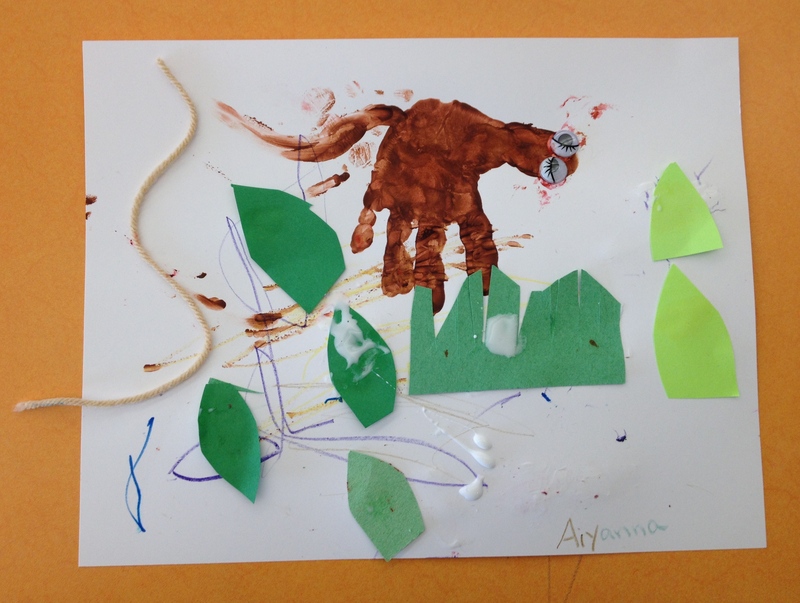 He’s a spider monkey and helped me talk about what a monkey looks like, what it eats, where it lives, how it travels, and of course what it sounds like. We talked about the difference between monkeys and apes also. With the exception of the spider monkey, did you know most monkeys do not actually get around using brachiation, in other words, do not actually swing from tree to tree? Monkey: Eeee, screeee, eee, eeeeeeeee, ee. Mac Barnett & Kevin Cornell made this story for storytime, I’m sure of it! Why is this a great storytime title? 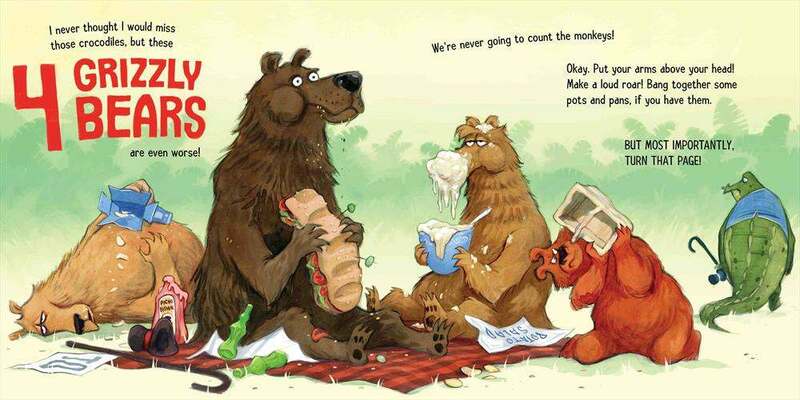 The book is funny, the illustrations are engaging, the characters and text reference other stories kids may know and want to talk about (Red Riding Hood anyone? 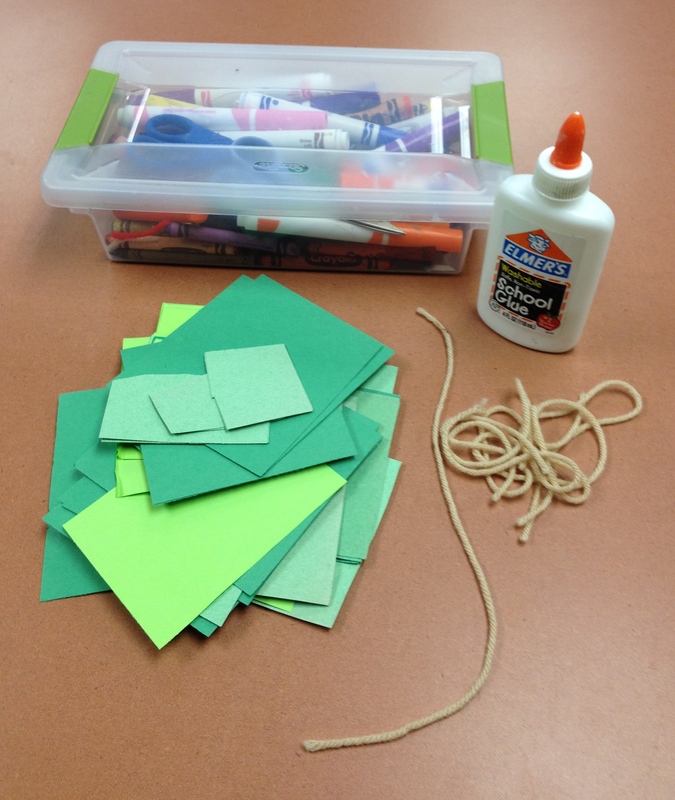 ), it gets kids counting (preschool math) and talking, and its interactive. 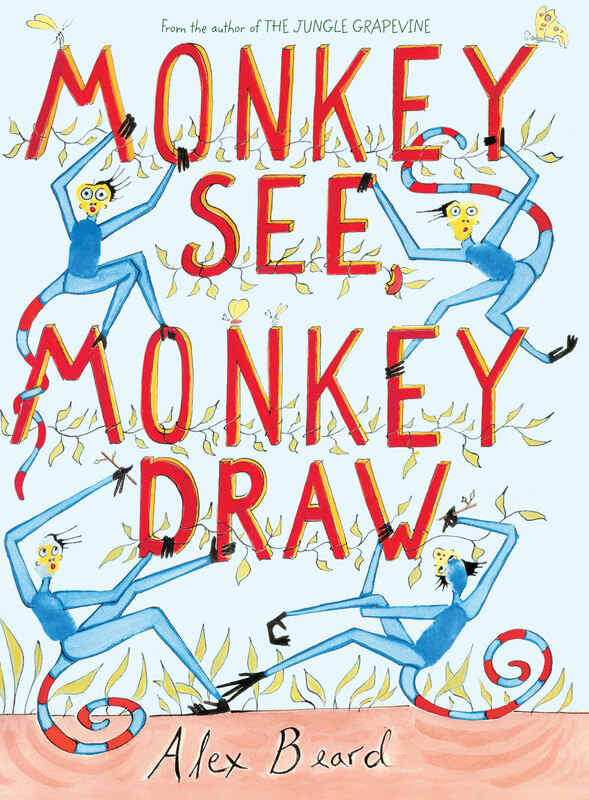 The premise is that readers are going to have the chance to count monkeys, but are woefully frustrated by the lack of monkeys on all of the pages…except the endpages. 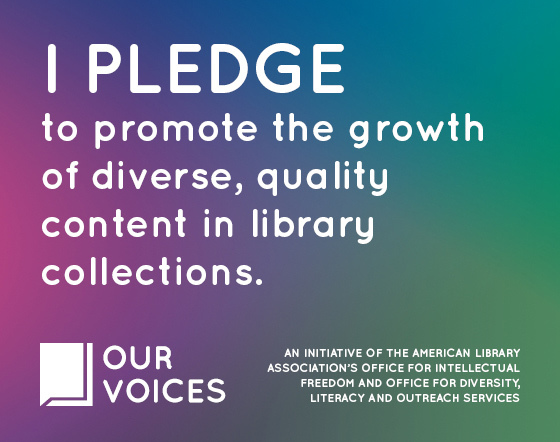 Readers will delight, however, in the variety of characters who take over the story. Who are your favorites? The proper beekeeping old ladies? The persistent lumberjacks? The pesky bears? The silly monkeys hiding at the end? 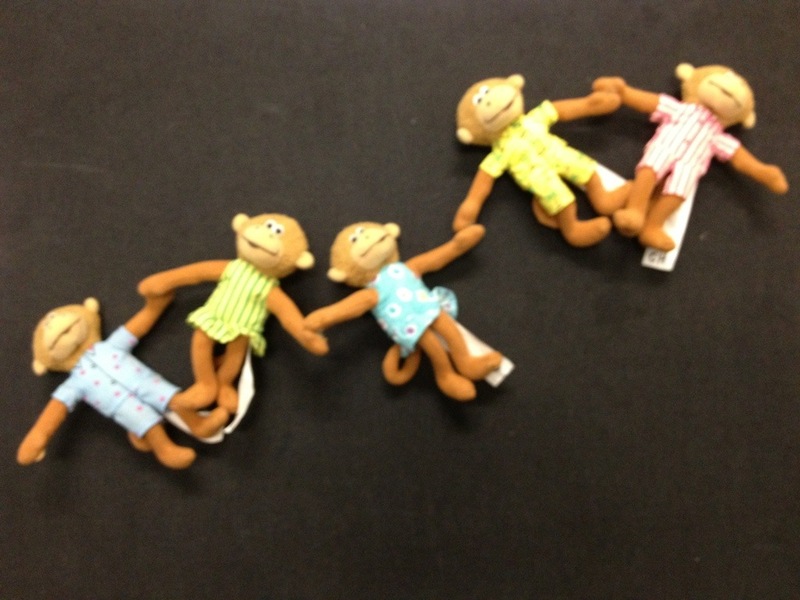 It was time to wiggle, so we did a full body version of Five Little Monkeys. Everyone stood up and then jumped (some pretended to fall off the bed) and sang while I used my finger puppets to guide the song. This song offers great opportunities for preschool math also. As we sing the song, I take breaks to talk about how many monkeys we have left, how many jumped off, and how many we have altogether, pointing out our use of addition. Note: I alternate “his” and “her” in each verse to be more inclusive. Alex Beard’s book inspired today’s craft. It’s the story of silly monkeys who love to play games, including monkey in the middle. During one such game the monkeys are terrified to discover that the seed pod they’re playing with gets tossed into the dark cave they fear. Along comes elephant, who isn’t afraid of the cave, to save the day. The monkeys are convinced to venture into the cave and, once their eyes adjust to the dark, discover the wall paintings that abound there. The monkeys turn to making their own paintings outside the cave and eventually turn art into a competition. They eventually learn that art isn’t a contest and that everyone’s art is important. The illustrations are beautiful, the characters endearing, and regional references useful in talking about the natural history of monkeys and elephants. Talking about the history of cave paintings can also inspire kids to tell stories in different ways. I used this book to talk about the craft we would be working on after the third story. Before the last story, I used our new parachute to introduce the preschool storytime families to a new version of Pop Goes the Weasel. We warmed up with a couple of other parachute songs that I’ve used in my outreach program and with the toddlers and then started popping our puppets in the air. I don’t have a stuffed weasel, but I do have a cool lizard, so I adapted the song. Everyone loved it just the same. We needed a transition from the crazy parachute time to our last story reading. I know just the thing. 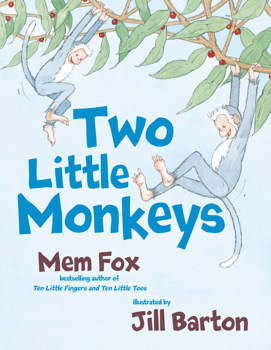 Mem Fox and Jill Barton teamed up to create a quick tale about Cheeky and Chee that is another nice storytime read. With repeating text, rhyme, and easy to see illustrations, the story features two monkeys having a grand time in the trees until a leopard comes along and almost has them for lunch. Cheeky and Chee are too quick and agile for the leopard though! This storytime went a little over 30 minutes, my usual length, but we were all having fun so it worked out fine. 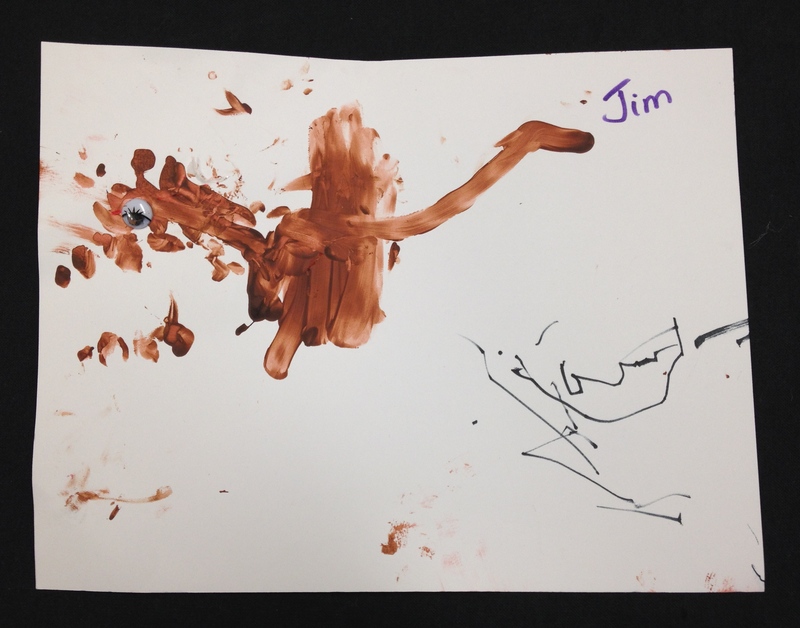 We used our hands and brown paint to create our own monkeys! 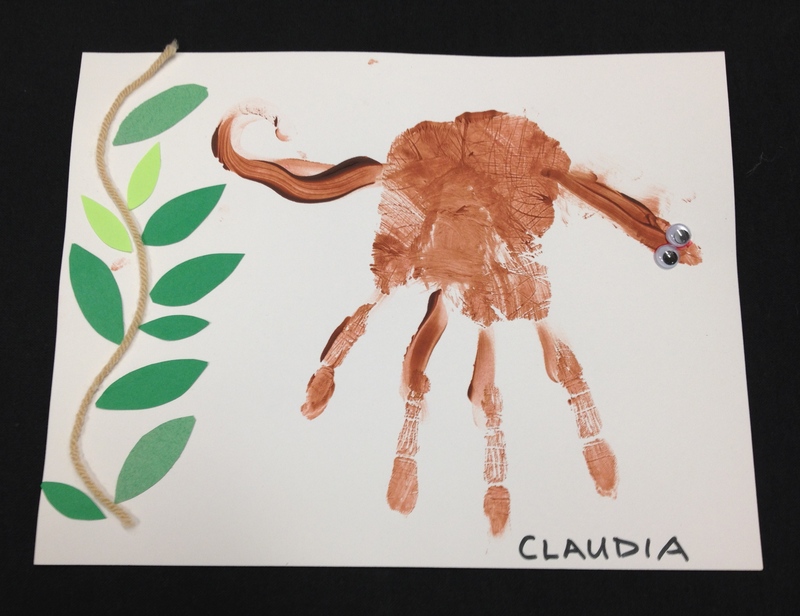 The preschoolers and siblings all enjoyed creating versions of my sample (scroll down for some of my favorites).